At the Inaugural Youth Ball, the new President of the United States of (North) America and the First Lady Obama salute the crowd. While the event is happening, we the audience indulge in its consumption by recording it, rather than experiencing the event itself. We engage the media, the channel, the interface, and not the message. This image speaks volumes about how we experience reality, about our relation with the image world, and about ownership. I saw it recently on Coscientious (through TomorrowMuseum, Venture Beat, Ekstasis, Constant Siege). 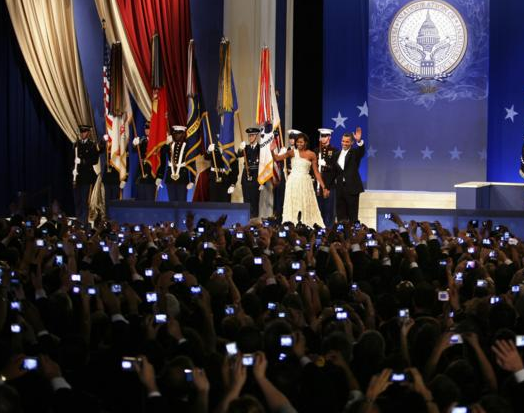 Although we have seem similar images or may have even experience this ourselves, specially during concerts, perhaps because of the event, Obama’s new presidency celebrations, it may have reached global values. It is obvious that such mass-recorded events could not have taken place last century, without the advent of new technologies that could facilitate both the mass production and the mass distribution of the photographic apparatus. But it was bound to happen, as more and more people become owners of digital cameras. There is a double intrinsic idea in the photographic act: not only you think it is worth recording, but it is also worth owning. The image Im taking is precious both because I was there and it was important, and because I desire to be the owner of that document. “Very likely, in the near future, I won’t “own” any music, or books, or movies. Instead I will have immediate access to all music, all books, all movies using an always-on service, via a subscription fee or tax. I won’t buy – as in make a decision to own — any individual music or books because I can simply request to see or hear them on demand from the stream of ALL. I may pay for them in bulk but I won’t own them. The request to enjoy a work is thus separated from the more complicated choice of whether I want to “own” it. I can consume a movie, music or book without having to decide or follow up on ownership. It is hard to chew a way forward in terms of a Photographic share economy, though while it seems excessive for mankind to record the same event with millions of cameras, we all want to have one, to take one. Maybe the issue is there, in the sharing. Or perhaps we have to relax and enjoy what we are experiencing rather than recording it (remember how we became slaves of our video-cameras in the 80’s? ), is it then a matter of education? a cultural construct?